Connie Davis was afraid to go into the bathroom. Fire escapes and stairwells at the Air Force bases where she was stationed also stirred fear. Enemies within the ranks could be lurking in such secluded spots. But Airman Davis, who started as a mechanic after joining the Air Force in 1974, said she was sexually assaulted despite her efforts to avoid places where she might be vulnerable. The Pemberton Township woman is not alone. One in four women and one in 100 men who receive care from Veterans Affairs report they are victims of military sexual trauma, also known as MST, according to the VA.
Davis, 64, said she knew that if she reported her assault, there would be retaliation. "You bury it. You move on," she said in a recent interview at the Garden State Diner, where she met up with fellow veterans Diane Smith, who was a Marine sergeant, and Alvina Wimbish, who was an Air Force staff sergeant. All three have been diagnosed with post-traumatic stress disorder. For them, solace comes from belonging to an unusual peer support group of veterans. The group meets weekly at the diner, near the Joint Base, in Wrightstown. Nearly all of the 60 veterans who attend are male, and at the root of their PTSD generally is what you might expect: combat trauma. The group includes five women. Two of the three who were interviewed cited sexual assault, along with exposure to harsh conditions in boot camp, as events that left a lasting scar. The third said she, too, had lived in fear of sexual assault while in the service. None have found it easy to talk about it. The men share their experiences with the group; the women tend not to. The three women weren't diagnosed until a few years ago, when their military experiences came up during therapy they sought for other problems. After leaving the service, all three worked at the mail processing plant in Hamilton, N.J., the target of an anthrax attack soon after 9/11. That terrifying experience, a car accident, a physical assault, and personal tragedies also contributed to the PTSD that they say started when they were on active duty. Davis recalled the humiliation she experienced when her ex-husband pushed her to tell her superior officer about being sexually assaulted. She said the officer told her the unwanted attention she received was her fault. "He made it seem like I was a whore, and I did nothing wrong," she said, her voice rising in anger. Smith, of Browns Mills, said she too was sexually assaulted and sexually harassed while she was in the Marines, between 1978 and 1984. She did not report it. "They would say you're just whining, you're being a girl. And you know you must never, never cry. You just act like it doesn't bother you," she said. In a survey released by the Pentagon last year, about 14,900 service members, male and female, reported they had experienced some form of sexual assault. The Pentagon also said six out of 10 reported retaliation after filing a complaint. Lori Maas, manager of the women's program at the Philadelphia VA Medical Center, said individual therapy and group programs are offered to women with PTSD and MST at clinics in the city and South Jersey. "The role of women in the military, until recently, was not in combat. But the war is still present for them: They are in the combat zones, and while they may not have the rifle, they are being exposed to traumatic events that are pretty significant," she said. Smith, 57, said she feels better after she goes to the peer support group at the diner, just being among veterans, male and female, all struggling to make sense of what happened to them. The men have welcomed them, she said, and the women enjoy the camaraderie. "We all went through some awful mess in the military. No one here wants to hurt you. … The group gives you a sense of being, that you're not the only one," Smith said. Until the interviews, Davis and Smith had not even disclosed to each other the sexual assaults they had endured in the military. "The stereotype of military women is they are either lesbians or whores," Davis said, shaking her head. 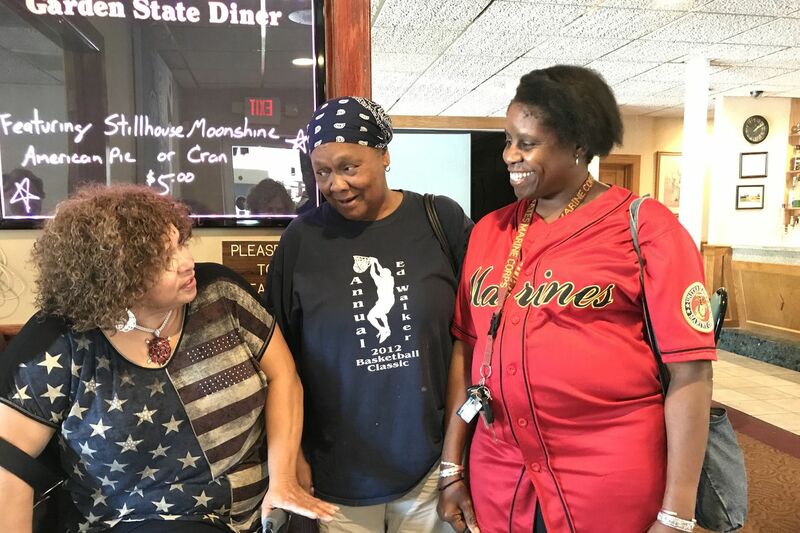 Alvina Wimbish (left), Connie Davis, and Diane Smith are among the very few women who attend a post-traumatic stress disorder peer support group that meets at the Garden State Diner. All three women were married and had children while in the service but still felt misunderstood, labeled. At one of the group meetings, one of the men reminded the others to curb their swearing because there are "ladies in the room." Smith, who has five children and five grandchildren, said that made her feel respected. Tony Capone, a retired social worker who counsels the group, said military women have the same anger issues and nightmares as the men. PTSD also causes anxiety and flashbacks, and can lead to suicide. He has counseled women with MST and others who witnessed death and destruction. He also has helped battlefield triage nurses whose job is to decide "who gets treated and who doesn't, and then they have to hold the hands of those who don't get treatment and watch them die," Capone said. Local veterans formed the group Capone leads at the diner two years after the VA disbanded its own peer support group at Joint Base McGuire-Dix-Lakehurst. The vets didn't want to travel to Philadelphia, where the VA started a new group. About 200 vets have signed up for the group that meets at the diner, and about 60 drop in each week. Wimbish, who started as a singer with an Air Force band in the early 1980s, said one of her most terrifying military experiences was when she was deployed during Desert Storm, to a Middle East location to support an aircraft-refueling mission. On the way there, she said, she was handed an M-16, though she had not received training in how to use it. "I was scared to death," she said. A few months later, she said, she and six others in her unit were left behind at a Middle East aircraft hangar for nearly a week after most of the other troops were evacuated. The pilot who came for them "laughed and said, `We forgot about you,' " she said. The unit had barricaded the hangar doors with furniture for protection and slept on desks. "It wasn't funny. It still hurts," she said. For Davis, there is the memory of a training drill at boot camp that turned fatal. She saw a recruit who was running in front of her collapse and die. "I blamed myself — I thought maybe I was too slow to help him," she said. Connie Davis is one of the women who attend a post-traumatic stress disorder peer support group at the Garden State Diner. For Smith, there was the racism she encountered off the base when she was stationed in Georgia. When she would ride her bicycle, some motorists would yell racial epithets and one passenger tried to knock her off the bike. Davis said she copes now by attending the group sessions, volunteering at church, and painting. One portrait is labeled "Silent pain." "All of us just try to bury it all," Davis said. "But we probably shouldn't." “Why Momma?” is one of several paintings created by Connie Davis, who uses art to release feelings of post-traumatic stress disorder.